Dan Pearson wasn't particularly enthralled by this ball-achingly bad movie tie-in when he wrote the Eurogamer review, and indeed, one journalist I barely know took it upon himself to contact me telling me that it is the one of the worst games he's played in the last 20 years (a claim that fell on deaf ears here, having played Dark Castle on Mega Drive and Road Fighter on NES). Regardless, the absolutely awful nature of the game was enough to intrigue me and sure enough, G.I. Joe manages to be live up (or down) to expectations in terms of its worth as a cross-platform console project. While there have been worse PS3 conversions dotted throughout the previous score of Face-Off features, there haven't been that many of them, and certainly not many of them in the reasonably recent past. 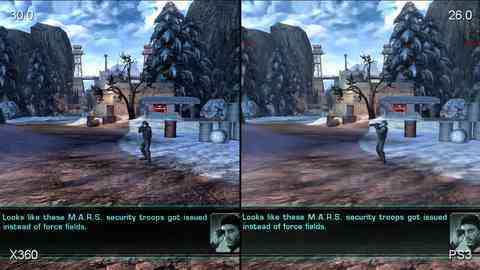 It's another situation where the HD clickthrough video does a better job at highlighting the differences, but for the record, the PS3 work done here is of an exceptionally low quality. While the developer has managed to retain 720p resolution, it has done so at the expense of texture quality and more v-sync drop-outs. The paring-back of textures is profoundly impactful to the image (even the character textures are pared back), and when combined with the Quincunx anti-aliasing it results in a game that looks significantly backward up against its 360 sibling. I won't dwell on this one, as I'm sure the people that have played it won't thank me for reminding them of it, but suffice to say that while G.I. Joe conforms exactly to the perception of the quality of the average movie tie-in, it's surprising to see a company like Electronic Arts pump out this kind of dross these days. From the ridiculous to the sublime. EA's abject failure with G.I. Joe is in stark contrast with the majority of its latter-day output, where the company has raised the bar both in terms of the quality of its games and also in the proficiency of its conversion work. 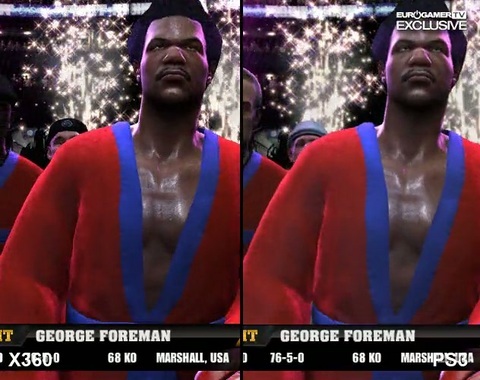 Fight Night Round 4 doesn't disappoint in just about any way, and that situation holds true whether you own an Xbox 360 or PlayStation 3. Yes, on a purely analytical level there are technical advantages to playing the game on the Microsoft console, but there's really nothing in it that favours one version over the other in terms of the actual gameplay experience. The similarities and, indeed, the subtleties of the differences can be seen in the videos, particularly the HD clickthrough. The crucial factors in the success of the conversion work have been covered in Digital Foundry's prior assessments of the Xbox demo and its PS3 counterpart. During the actual gameplay, frame-rate is locked to a v-synced 60FPS, and in that regard there is no difference whatsoever between the two games. Over and above that, the quality of the artwork in the game is like-for-like. The only real difference comes from the anti-aliasing techniques deployed in each version and in this area, Xbox 360 commands a marginal advantage with its top-of-the-line (for console) 4x multi-sampling anti-aliasing. Similar to EA's last fighting game, PS3 employs 2x quincunx AA. This gives very close edge smoothing to the Xbox solution with the minus point that the entire texture is blurred. The difference is noticeable, but it's not a massive issue bearing in mind the sheer intricacy of the base visuals. Any other performance advantages the Xbox 360 version has are limited to superior frame-rates in the sequences outside of the core action: a solid 30FPS on the Microsoft console with mild fluctuations under that on PS3 (still retaining v-sync). Hardly monumental stuff, and where it matters - in the gameplay - nobody is likely to be disappointed.